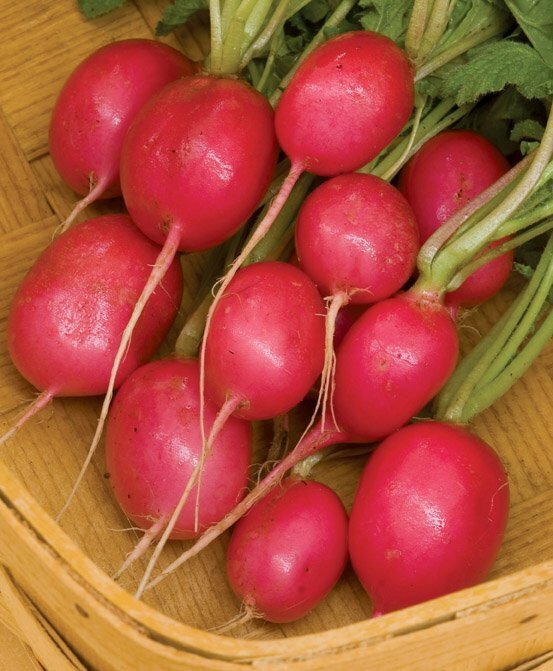 If you are in a rush to get your spring vegetable garden growing, a pack of radish seeds will scratch that itch. Radishes are just about the fastest maturing vegetables around. Of course, raising radishes because they develop quickly is not the only reason to plant these tasty root crops. There are also nutritional benefits to consider—calcium, potassium, phosphorus, magnesium, vitamin C—these little underground nuggets are loaded! For rapid results, the popular cultivars ‘Cherry Belle’, ‘Pink Beauty’ and ‘Early Scarlet Globe’ mature in about three weeks—that’s fast. ‘Champion’ and ‘Crimson Giant’ take a week longer, but both are tasty enough to be worth the wait. Ditto for ‘German Giant’ and ‘Plum Purple’. 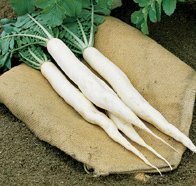 Also, consider the mild, hot weather-resistant Oriental radishes called “Daikons,” most of which look like long, white carrots. ‘Summer Cross’ and ‘April Cross’ are two of the more commonly grown selections. Many radishes are fairly mild tasting, but if grown improperly, they will easily sizzle the taste buds. For the best flavor, radishes must be planted at the right time, which is March into early April, while the weather is still cool. Fall crops can also be planted at the beginning of September. Plant radish seeds a half-inch deep in well-worked soil. Don’t just scatter seeds because, when thinning young plants, you could easily disturb the remaining roots. For maximum production, plant seeds about 2 inches apart in beds rather than lining ’em up in rows. Naturally, fertilizer can boost radish production. However, too much nitrogen will result in loads of lovely leaf tops but skimpy radish roots. Since radishes grow fast, you can start successive plantings every two to three weeks. This can continue until temperatures start to creep into the upper 70s. Warm weather will turn typical radishes pithy, and as the temperatures rise, so too does their pungent punch. Watering can also temper your radishes’ flavor. After the plantlets reach about an inch high, water them at least once a week, if the rains don’t come. In addition, a light organic mulch will help retain moisture and prevent stress, resulting in crisper, milder tasting radishes. And if, after doing all the above, your radishes are still a little too spicy for your taste, grab a vegetable peeler. The volatile oils that put the peppery pucker in radishes are concentrated in the skins and outer layers of flesh, so simply slice these hot spots off. The roots are the main reason most gardeners grow this veggie, but if you would like to add a little extra zip to salads, steamed greens or stir-fries, toss in some young radish leaves. They are as delicious as they are nutritious, having six times the amount of vitamin C as the roots and being an excellent source of calcium.